When it comes to convention promotion, reaching out to your target audience is essential in ensuring the success of your event. Your eloquent speaker, exciting trade show gimmicks, and well-orchestrated program for your conference may not create a loud bang for your buck if only a few people show up. Hence, it is important that you lure them to attend your event. No matter what promotional ideas and gimmicks you come up with, make sure that they are something that will cater to the needs and wants of your target attendees. Here are some convention promotion ideas that may help you fill up the attendance sheet. Calendars. A wall or desk calendar, planner or anything that involves dates is one of the best ways to remind your top priority target audience of your convention. This promotional material is your way of helping your target market to mark their calendars for your event and the deadlines for registration. So besides noting holidays and full moons, remember to mark in red the particular date(s) of your convention. To make it more useful to them, also mark important dates that are relevant to the specific people in their industry, such as due dates for renewing membership in an industry association. Since it entails some considerable amount of money to produce these promotional items, consider distributing them to targets who are more likely to come, such as those who have attended last year’s conference or similar events. Water Bottles, Coffee Mugs, Pens. Swanky-looking water bottles and mugs (such as those made of stainless-steel), pens, and other items that people will often use and take with them are great mediums to remind target audience of your event. Do not use cheap looking materials to avoid making a lousy impression. Make sure to clearly print your presentable logo and the title and date of the convention. These may also possibly be spotted by other people that they interact with such as family members, colleagues and classmates who also may be interested to attend. An Ad Explaining What’s In It For The Attendees. People will not attend your event if they do not expect to get any benefit from doing so. So what better way to convince your target market to show up in your convention than through ads that explain what benefits they get. You can post an online article on your site or blog or through PR sites entitled “Top 10 Benefits For Attending (Your Conference Name)”, or Top 10 Reasons For… Then, of course, you have to list down these benefits and reasons to attend your event. This could include both tangible and intangible rewards. Make them sound as enticing and engaging as possible, and make sure these are all true. If you have to, hire an expert copywriter to do the writing. Money Blowing Machine. Imagine something similar to a telephone booth blowing paper bills and discount coupons inside as part of your exhibit. People’s eyes would normally be drawn to it. 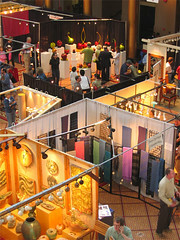 Then you announce that those who would drop by the booth and leave their names and particular details (such as emails, phone numbers and other details you may need for your next events, or for post-convention activity) will have a chance to enter the booth for 20 minutes to collect all the cash and discount coupons they can grab. The extravaganza is fun and attention-grabbing enough, but the chance to be in the booth to fetch some cash adds to the allure. Popcorn or Ice Cream Booth. Food, such as ice cream and popcorn, can be another bait to attract booth visitors. You can customize the packaging (cups or bags) to bear your brand logo or company name. Foot or Back Massage Booth. Attending a convention can be exhausting. Offer your booth visitors some rest and relaxation by preparing massage chairs to massage their tired feet and back for five minutes per person. In exchange, they have to give their names and details which you can use for your next events. Photo Booth. Give your visitors a remembrance for their attendance of the convention by providing a photo booth that can instantly print their pictures. The background can contain your brand logo and name to remind them of your product and company. You can provide costumes and props to make it more fun. Make them relevant to the type of business or industry that you are in or the theme of the convention. There are more ways to attract attendees and booth visitors; brainstorming about them when you plan for your convention promotion is a great way to identify the most appropriate methods. Hey Buddy!, I found this information for you: "Convention Promotion Crowd-Drawer Ideas". Here is the website link: https://mastertheevent.com/convention-promotion-crowd-drawer-ideas/. Thank you.